The Clemson football team will hold a parade and stadium celebration on Saturday, Jan. 12 beginning at 9 a.m., in order to recognize the Tigers for winning the College Football Playoff championship. Therefore, teams and fans planning to attend the Orange & Purple Open at the Clemson Indoor Track & Field Complex should anticipate heavy traffic and detours with the closing down of Hwy 93 and College Avenue, in particular, and allow ample time to commute to the indoor track facility. 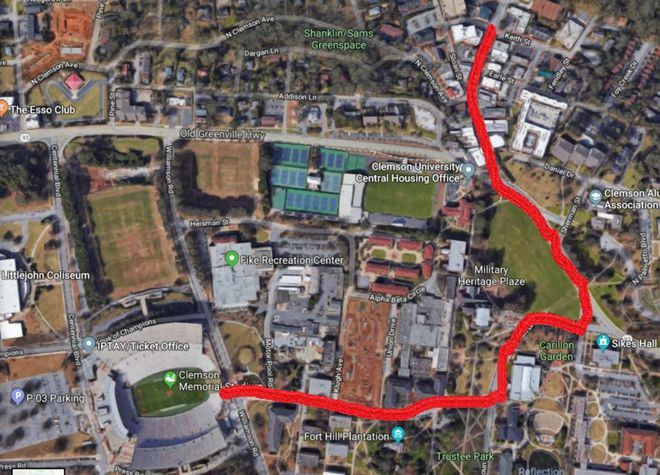 It is recommended that those wishing to attend Saturday’s track & field meet avoid Hwy 93 and the downtown Clemson area and utilize Perimeter Rd to access the Clemson Indoor Track & Field Complex. Additionally, the Clemson men’s basketball team will host Virginia in Littlejohn Coliseum at noon. Saturday’s football celebration is expected to conclude before noon. Below is a release from the city of Clemson, that outlines more details regarding Saturday’s activities. A parade honoring the Clemson University Undefeated National Champion football team is planned for Saturday, January 12th, 2019. The parade will start at 9 am at the intersection of College Avenue and Keith Street in Clemson, according to the university. The parade will Parade will proceed to Hwy 93 and turn left onto Hwy 93 in front of Bowman Field. The route will then take a right onto Calhoun Drive and finally take a right onto Fort Hill Street where it will end at the east side of Memorial Stadium. Parade will include Players, Coaches, Administrators, Invited Guests, Tiger Band, Cheerleaders, Rally Cats, Mascots and many more. Memorial Stadium will open at 7 am on Saturday for fans who wish to go straight to the stadium rather than stand along the parade route. The parade will be shown on the stadium’s big screen starting at 9 am. The celebration will continue at Memorial Stadium once the parade arrives there (approximately 10:30am). Players, coaches and other special guests are expected to speak to the crowd. The celebration is expected to end before noon, Clemson University said.